The photos on this page were moved here from my Signs section to accompany an article I'm working on for the Society for Commercial Archeology's Journal magazine. 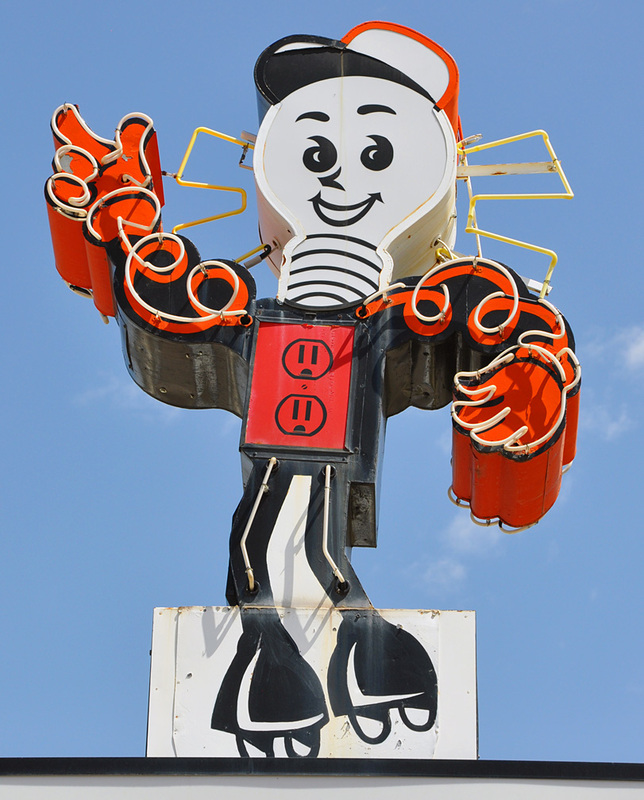 The Reddy Kilowatt advertising character was developed in 1926. 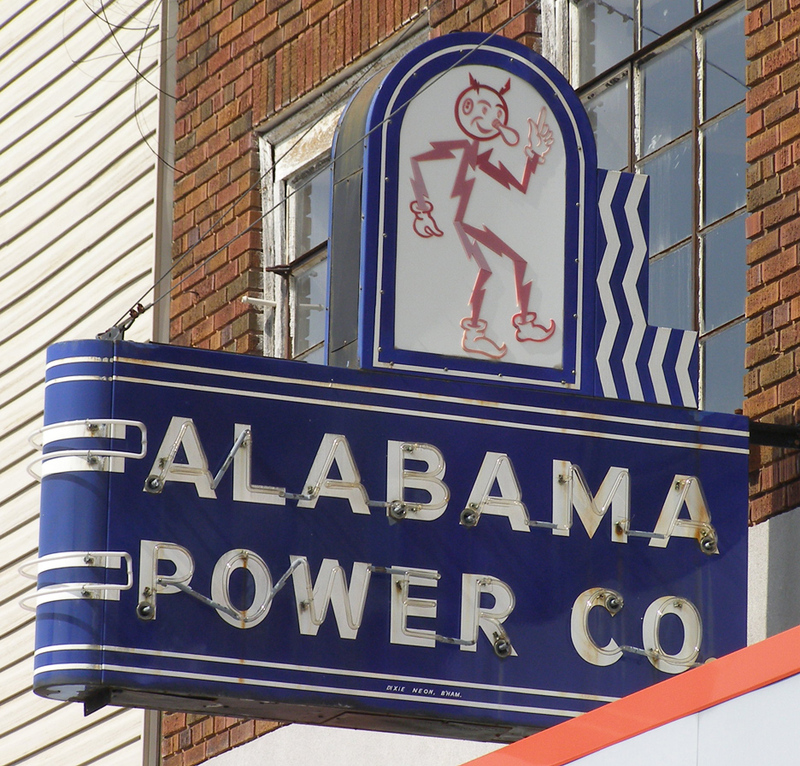 The character was designed for the Alabama Power Company by Ashton B. Collins, Sr. Supposedly, the inspiration for the figure came to him in a lightning storm. His torso, arms, and legs are composed of lightning bolts. Two small lightning bolts adorn his bald head. He has a light bulb nose and wall outlet ears. . He wears safety gloves and boots. 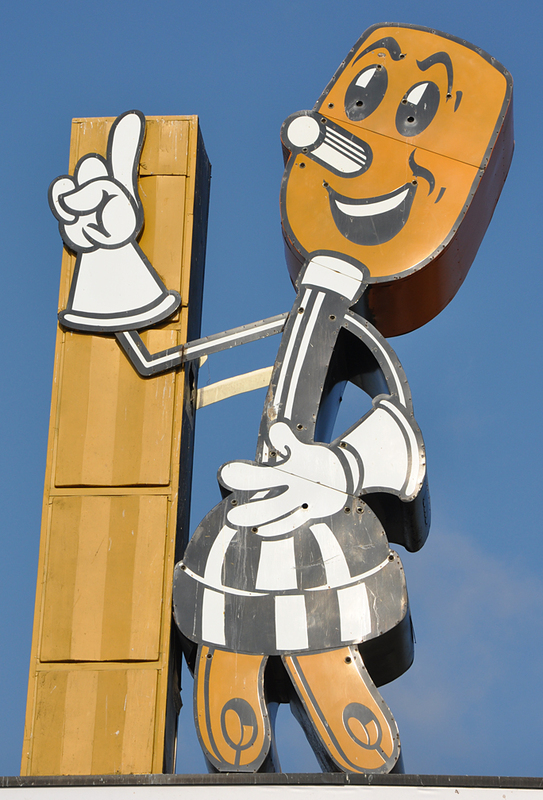 Reddy's stick-figure design was refined in 1933 and trademarked in 1935. In 1946, the character was tweaked a bit more by cartoonist Walter Lantz. Reddy became shorter and better-proportioned. He went from five fingers to four like other cartoon characters like Woody Woodpecker, another Lantz creation. The size of his eyes and his smile were increased. The character was used in print advertising and, later, television commercials. Reddy appeared in an extensive marketing campaign with merchandise produced for licensed electric companies and the general public. His image appeared on cookbooks and aprons, pens and pencils, lapel pins and earrings, china plates and coasters, lighters and ashtrays, children's coloring and comic books, company and sports team uniform patches, and more. 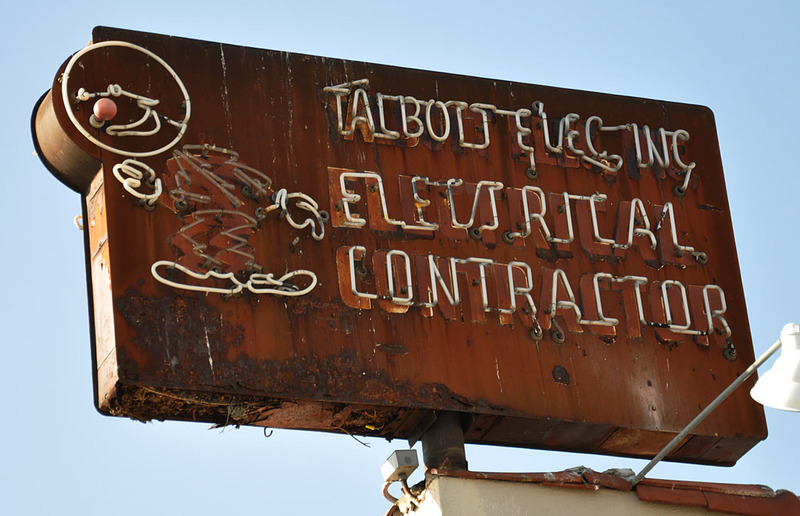 The slogan "Your Electric Servant" usually accompanied his image. In the contracts with hundreds of individual electric companies, the licensee agreed to always represent Reddy as "genial, likeable, well-mannered and even-tempered." 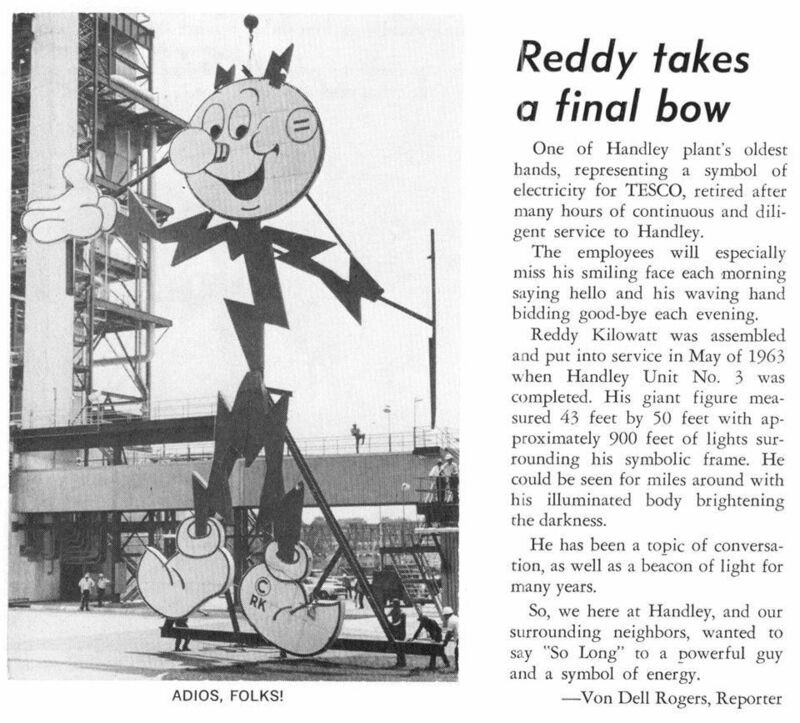 The Reddy Kilowatt Service provided the companies with a catalog of approved products and images which could be adapted for different purposes. The RKS also produced a magazine which features news and promotional ideas. His image was licensed and used in many countries outside the United States. 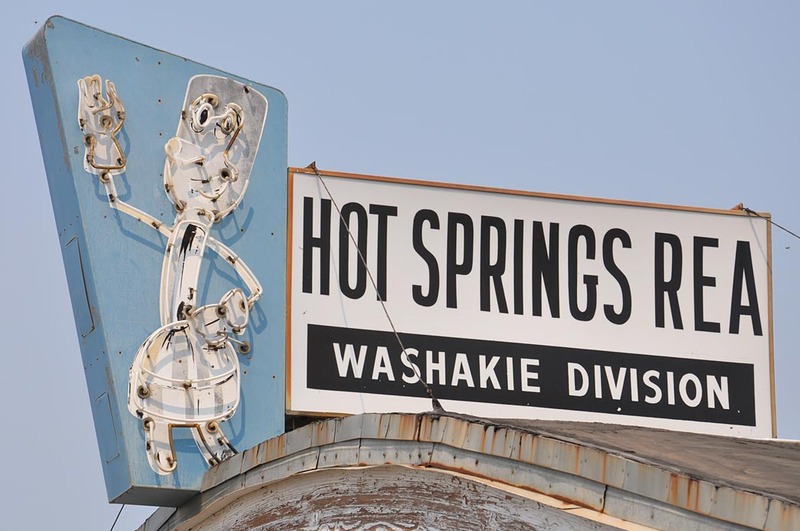 There were dozens of neon signs with Reddy's likeness built in the 1940s and 1950s but only eight survive. 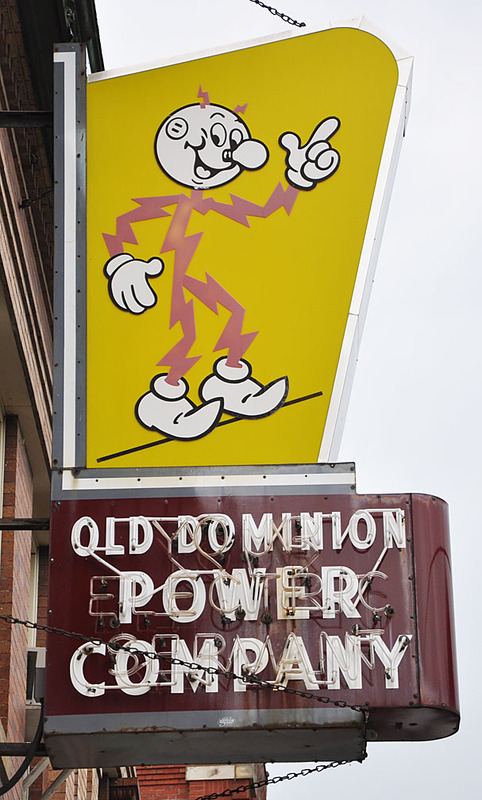 By the 1970s, use of the Reddy character was in decline. Only a handful of companies still use Reddy's image. For more, see these websites: 1 and 2. If you know of any Reddy signs missing from this list, I'd love to hear from you. 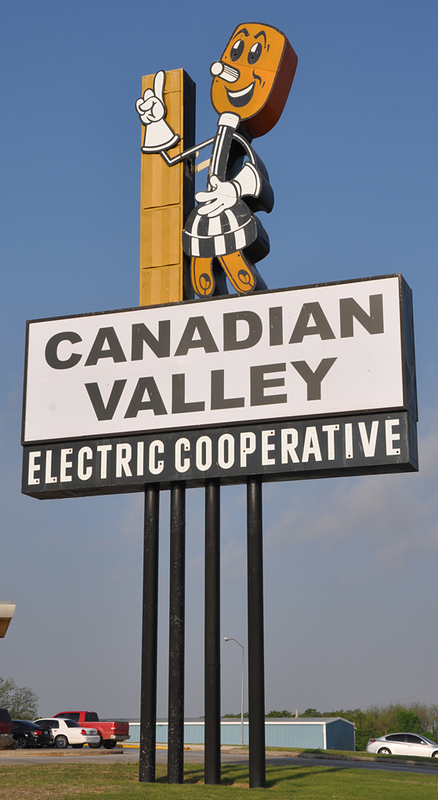 In 1950, the National Rural Electric Cooperative Association sought permission to use the Reddy Kilowatt character but they were turned down. The management felt that cooperatives were "socialist" enterprises. 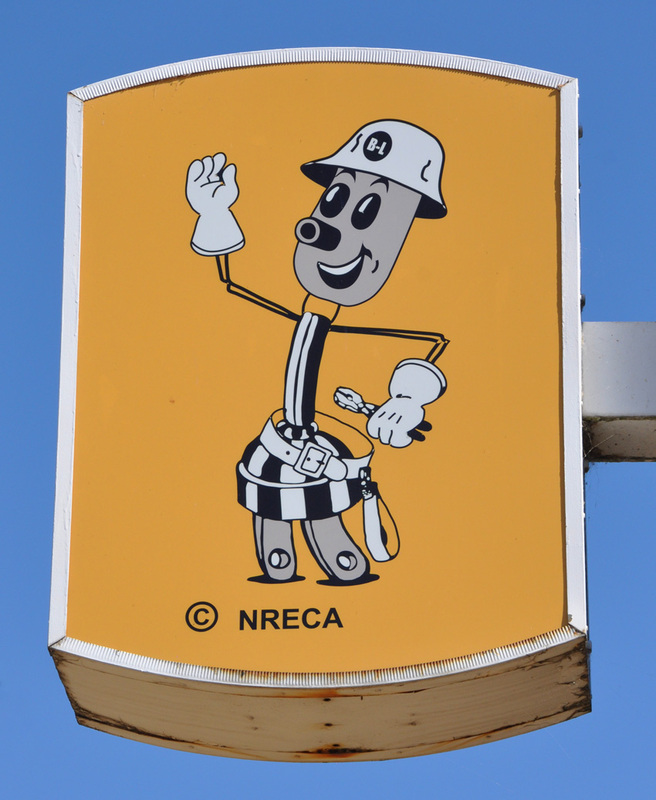 So, the NRECA developed their own character, Willie Wiredhand. 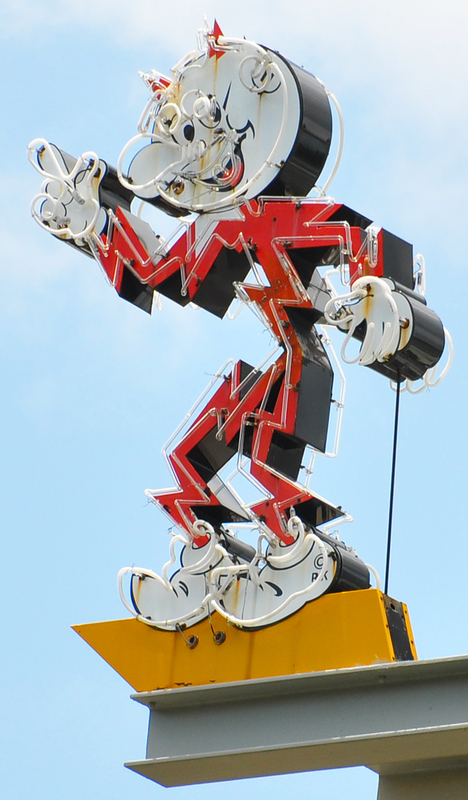 He was designed by Andrew McLay in a contest sponsored by the NRECA in 1951. The figure has an electric cable body, a light-socket head, a push-button nose and an electrical plug for his lower torso and legs. The name came from the idea of rural electric service being a farmer's "hired hand" and the substituted word "wired" was a natural choice. In 1953, Reddy Kilowatt, Inc. (RKI) sued the NRECA for trademark infringement, believing that the characters were confusingly similar. In 1956 and 1957, two courts found that the characters were different enough and Willie survived. His image is still used in advertising and on company uniforms. For more, see these websites: 1 and 2. 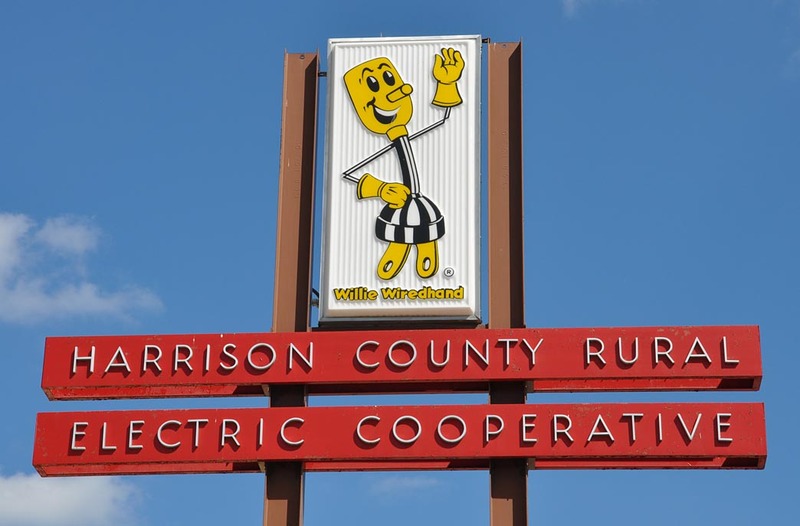 The embossed plastic Harrison County Rural Electric Cooperative sign featured the Willie Wiredhand mascot. It was probably built in the 1960s. This photo is from 2012. By 2016, the sign was gone. If you know of any Willie signs missing from this list, I'd love to hear from you.